On 10 January 2019, the National Intellectual Property Administration of China (CNIPA, formerly known as SIPO) held the Q1 press conference in Beijing, releasing the major IP statistics for the Chinese mainland in 2018. 2018 saw a steady growth in the number of IPR applications, showing a good momentum of development. In 2018, applications relating to invention patents increased steadily and reached 1,542,000, of which 432,000 were granted. The invention patents filed by domestic applicants (346,000) still significantly outnumbered those filed by foreign applicants (86,000). By the end of 2018, the cumulative number of invention patents held by the Chinese mainland was 1,602,000, and the number of invention patents owned by per 10,000 head of population reached 11.5. In 2018, the CNIPA received in total 55,000 PCT applications, with a year-on-year increase of 9%, of which 52,000 were filed by domestic applicants with a year-on-year increase of 9.3%. The top three provinces/municipalities for invention patents for each 10,000 heads of population were: Beijing (111.2), Shanghai (47.5), Jiangsu (26.5). Huawei was once again #1 for invention patents obtained. 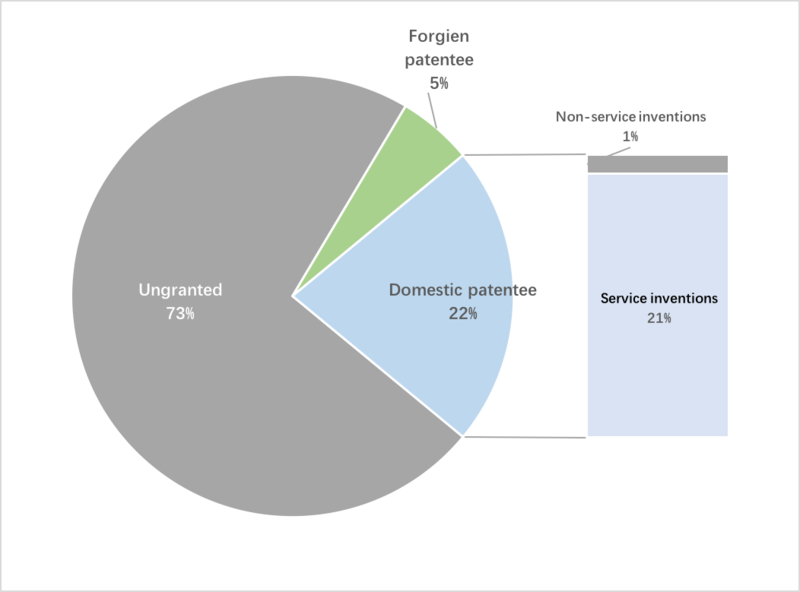 In 2018, a total number of 808,000 invention patent applications, 1,874,000 utility model patents and 667,000 design patents were examined. While the number of patent applications increased, the examination time for patent applications decreased steadily and the time for high-value patents was reduced by 10%. With respect to re-examination, 38,000 requests were filed, of which 28,000 were closed. As for invalidation, 4,000 out of 5,000 requests of declaration were settled. The trade mark field was also busy. Trade mark applications continued to grow. A total of 7,371,000 applications for trade mark registration were accepted in 2018, of which 5,070,000 were granted, and 5,007,000 were from domestic applicants. By the end of 2018, the cumulative numbers of valid registered trade marks in Mainland China (excluded those applications applied by foreign applicants and the Madrid applications) reached 18,049,000. The number of trade marks owned by per 10,000 market entity reached 1,724. In 2018, 6,594 Madrid international trade mark applications were filed. By the end of 2018, 31,000 applications of the Madrid international trade mark were filed by domestic applicants, with a year-on-year increase of 23.5%. In 2018, 8,043,000 trade mark applications were examined. Notably, in 2018, the average time for trade mark examination were reduced to 6 months. IPKat readers may remember that in an earlier post (here), it was mentioned that the State Administration of Industry and Commerce had set a goal in the Opinions on Deepening the Reform of Trademark Registration Facilitation and Effectively Raising Efficiency of Trademark Registration to shorten the examination time for trade mark to 6 months by the end of 2018: the task was completed 52 days ahead of schedule. In 2018, 322,000 requests of trade mark review were filed, of which 265,000 were closed. The time for reviewing the trade mark registration rejections was reduced to 7 months. In 2018, 67 GIs were granted. 'GIs', as mentioned in Article 2 of the Provisions on the Protection of Geographical Indication Products, refers to those products which originate from a specific region, and whose quality, reputation or other characteristics dependon the natural factors and humane factors of the area of production. 223 enterprises were approved to use the special signs for GI-protected products. By the end of 2018, cumulatively, 2380 GIs were granted, and 8,179 enterprises were approved to use GIs. In 2018, the CNIPA received 4,431 applications for the registration of integrated circuit layout design, which increased year-on-year by 37.3%. In total of 3,815 applications for the registration of integrated circuit layout design were issued the registration certificate, with the year-on-year increase of 42.9%.